Our world is powered by USB. And by world I really just mean ‘phone’ which is probably the same thing. Having a few spare phone chargers is common practice but I’ve got one to show you that will become your dedicated cord for everything. 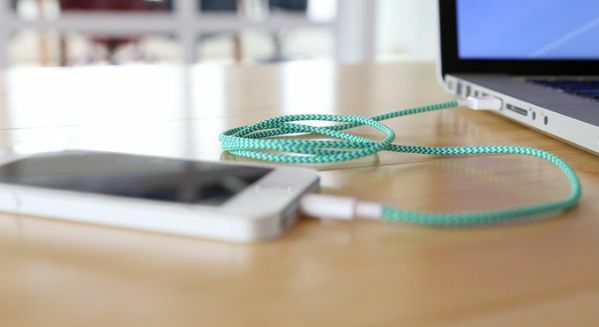 The BelayCord is the USB charger cable that will change your life. No really! I don’t usually share Kickstarter projects with you but this one, this one WILL change your life for one simple reason. The USB connector is reversible. Meaning it doesn’t matter which way you stick it in, it will fit no matter what. Say goodbye to the hassle of having to re-try your cable three times before you’ve got it inserted properly. With this cord, it will just work. First time. In addition to the obvious wonder of not having to waste aeons just trying to plug the thing in, the charger has a heavy nylon wrap meaning that it’s suitable for a lifetime of being wrapped up and thrown into bags. Or just one jerk pet with a chewing problem. In fact they’re giving it a lifetime guarantee (sorry Lifetime Guarantee! ), which is definitely not to be sniffed at. The cable is good for both Apple and non-Apple products. A $30 pledge will get you one and it’s due to ship November of 2014.